The benefits of adding support for Android Nougat to your website & app are not only limited to providing better customer care. According to Forrester, having online tutorials available will likely reduce cost by deflecting agent-assisted interactions; furthermore, adding relevant support content can assist your SEO efforts. Android Nougat is the latest, big refresh of Google’s smartphone and tablet operating system. The OS was already released for Google’s Nexus devices. In the next few months, the update will likely be rolled out to many other recent models that are powered by Android, Tech radar reports. While the Nougat update aims to make the user experience even better, the changes may initially bring some difficulties. To offer better support to customers, we have made a list that you can use as a starting point for your support content planning. There are 250 new features, we have summarized the most prominent ones based on information from Google, as well as our own analysis of the Nexus devices. This new feature enables user to run two applications side-by-side, on the same screen. 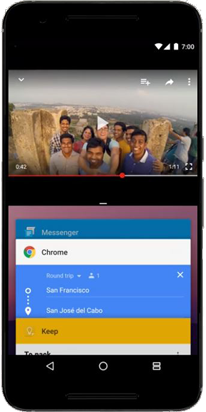 Through split screen functionality, users can watch YouTube videos and chat at the same time. Explaining to your customers how to take advantage of the Multi-window view will certainly bring them value. Moreover, you can add a guide, aiding the productivity and the quicker multitasking of your customers by explaining how “Quick Switch” between apps works. Multi-window view. Android 7.0 Nougat enables users to be “in two places at once” – photo credit: Google. The new quick settings menu enables an easy access to top settings’ tiles (e.g. Wi-Fi, mobile data, etc.) in the notification bar. We can provide a tutorial helping your customers to customize this menu and rearrange it as they see fit. The quick setting is intended to deliver usability improvement to your customers by ensuring faster access to top settings tiles in the notification menu – photo credit: Google. 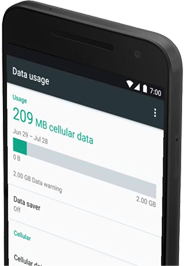 Data saver enables users to limit their data usage. When it is activated, it disables the access to cell data for apps running in the background. Data saver will give your users more control over how they user their own data plans. Data Saver – photo credit: Google. Doze mode helps users save battery life when their device is stationary, TechRadar remarks. It limits the background tasks and puts the device in deep standby mode whenever the screen is turned off. Teaching your customers how to use the Doze mode will help them to get rid of the battery drain issues. Doze mode – photo credit: Google. Notifications are improved in Android 7. Users can reply directly, without opening the chat application. Also, notification cards from a single app are bundled together for simplicity. The latest version of the mobile OS allows a great deal of customization. Providing tutorials guiding your customers through the numerous options will certainly be appreciated. Android 7 Nougat improved notifications – photo credit: Google. This new mode enables users to turn on and off work apps and notifications. This work mode is intended to help your customers to get better work-life balance. The benefits of adding Android 7.0 Nougat support content cannot be overstated. However, producing high-quality, interactive content which is optimized for your users’ search inquiries might be pricey to do in-house.